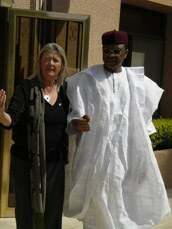 Ambassador Barbro Owens-Kirkpatrick and HDI to Niger for fistula | HDI: Health & Development International, Inc. In January 2005, Ambassador Barbro Owens-Kirkpatrick (who has since become Chair of HDI’s board in the US) was accompanied by HDI’s executive director on a trip to stimulate and support obstetric fistula prevention and treatment in Niger. Irene de Watteville, a staunch supporter of HDI in recent years. Thanks to the high regard in which the ambassador is held and the quality of the plan, support was secured at political level including Niger’s Head of State and the First Lady, for HDI’s suggestions as to how to save the lives of women in obstructed labor and prevent obstetric fistula. HDI’s executive director stayed for about three weeks to work on guinea worm eradication, and obstetric fistula with national program professionals and to visit affected localities as part of the planning process. A detailed fistula prevention plan was developed together with Niger’s Ministry for Promotion of Women and Protection of Children, and the Ministry of Health.